For the transition period from ___________ to ____________. Indicate by check mark whether the registrant is a large accelerated filer, an accelerated filer, a non-accelerated filer or a smaller reporting company. See the definitions of "large accelerated filer," "accelerated filer" and "smaller reporting company" in Rule 12b-2 of the Exchange Act. The aggregate market value of the voting stock held by non-affiliates of the registrant based upon the closing price of the registrant’s common stock on September 26, 2014 as reported on the NASDAQ Global Select Market was approximately $12,220,670,000. Shares of common stock held by each executive officer and director and by each person who owns 5% or more of the outstanding common stock have been excluded in that such persons may be deemed affiliates. This determination of affiliate status is not necessarily a conclusive determination for other purposes. As of April 24, 2015, the registrant had 258,596,234 shares of Common Stock outstanding. Parts of the Proxy Statement for the Registrant’s Annual Meeting of Stockholders to be held on August 12, 2015 are incorporated by reference into Part III of this Annual Report on Form 10-K. This Annual Report on Form 10-K contains forward-looking statements within the meaning of the Private Securities Litigation Reform Act of 1995. Forward-looking statements may be found throughout this Annual Report and particularly in Items 1. "Business" and 3. "Legal Proceedings" which contain discussions concerning our development efforts, strategy, new product introductions, backlog and litigation. Forward-looking statements involve numerous known and unknown risks and uncertainties that could cause actual results to differ materially and adversely from those expressed or implied. Such risks include, but are not limited to, those discussed throughout this document as well as in Item 1A. "Risk Factors." Often, forward-looking statements can be identified by the use of forward-looking words, such as "may," "will," "could," "should," "expect," "believe," "anticipate," "estimate," "continue," "plan," "intend," "project" and other similar terminology, or the negative of such terms. We disclaim any responsibility to update or revise any forward-looking statement provided in this Annual Report or in any of our other communications for any reason. intellectual property (IP), which consists of Xilinx and various third-party verification and IP cores. In addition to its programmable platforms, Xilinx provides design services, customer training, field engineering and technical support. Our PLDs include field programmable gate arrays (FPGAs), complex programmable logic devices (CPLDs) that our customers program to perform desired logic functions, and programmable SoCs, which combine industry standard ARM® processor-based systems with programmable logic in a single device. We also design and develop 3D ICs, which consist of a combination of FPGAs, transceivers and a wide memory interface in a single package to exceed the capacity and bandwidth of monolithic devices. Our product portfolio is designed to provide high integration and quick time-to-market for electronic equipment manufacturers in end markets such as wired and wireless communications, industrial, scientific and medical, aerospace and defense, audio, video and broadcast, consumer, automotive and test and measurement. We sell our products and services through independent domestic and foreign distributors and through direct sales to original equipment manufacturers (OEMs) and electronic manufacturing service providers (EMS). Sales are generated by these independent distributors, independent sales representative or our direct sales organization. Xilinx was founded and incorporated in California in February 1984. In April 1990, the Company was reincorporated in Delaware. Our corporate facilities and executive offices are located at 2100 Logic Drive, San Jose, California 95124, and our website address is www.xilinx.com. There are three principal types of ICs used in most digital electronic systems: processors, which generally are utilized for control and computing tasks; memory devices, which are used for storing program instructions and data; and logic devices, which generally are used to manage the interchange and manipulation of digital signals within a system. Xilinx designs and develops PLDs, a type of logic device. Alternatives to PLDs may include application specific integrated circuits (ASICs) and application specific standard products (ASSPs). PLDs, ASICs and ASSPs may be utilized in many of the same types of electronic systems. However, differences in unit pricing, development cost, product performance, reliability, power consumption, capacity, features and functionality, ease of use and time-to-market determine which devices are best-suited for specific applications. Faster time-to-market and increased design flexibility. Both of these advantages are enabled by Xilinx desktop software which allows users to implement and revise their designs quickly. In contrast, ASICs and ASSPs require significant development time and offer limited, if any, flexibility to make design changes. PLDs are standard components. This means that the same device can be sold to many different users for a myriad of applications. In sharp contrast, ASICs and ASSPs are customized for an individual user or a specific application. PLDs are generally disadvantaged in terms of relative device size when compared to chips that are designed to perform a fixed function in a single or small set of applications. ASICs and ASSPs tend to be smaller than PLDs performing the same fixed function, resulting in a lower unit cost. However, there is a high fixed cost associated with ASIC and ASSP development that is not applicable to PLD customers. This fixed cost of ASIC and ASSP development is expected to significantly increase on next generation technology nodes. From a total cost of development perspective, ASICs and ASSPs have generally been more cost effective when used in high-volume production, and PLDs have generally been more cost effective when used in low- to mid-volume production. However, we expect PLDs to be able to address higher volume applications and gain market share from ASIC and ASSP suppliers as the fixed cost of ASIC and ASSP development increases on next generation technology nodes. Our strategy for expansion is the displacement of ASICs and ASSPs in the development of next generation electronic systems. The costs and risks associated with application-specific devices can only be justified for high-volume or highly-specialized commodity products. Programmable platforms, alternatively, are becoming critical for our customers to meet increasingly stringent product requirements - cost, power, performance and density - in a business environment characterized by increased complexity, shrinking market windows, rapidly changing market demands, capped engineering budgets, escalating ASIC and ASSP fixed engineering costs and increased economic and development risk. With every new generation of FPGAs, our strategy is to increase the performance, density and system-level functionality and integration, while driving down cost and power consumption at each manufacturing process node. This enables us to provide simpler, smarter programmable platforms and design methodologies allowing our customers to focus on innovation and differentiation of their products. other new or emerging programmable logic products. access to advanced packaging technology. A brief overview of the silicon product offerings is listed in the table below. These products comprise the majority of our revenues. Additionally, some of our more mature product families have been excluded from the table, although they continue to generate revenues. We operate and track our results in one operating segment for financial reporting purposes. See information under the caption "Results of Operations - Net Revenues" in Item 7. "Management’s Discussion and Analysis of Financial Condition and Results of Operations" for information about our revenues from our product families. See also "Note 16. Segment Information" to our consolidated financial statements included in Item 8. "Financial Information and Supplementary Data" for information regarding segments. Xilinx recently introduced the UltraScale+ portfolio, which consists of three product families, and is manufactured using Taiwan Semiconductor Manufacturing Company Limited's (TSMC) 16 nanometer (nm) FinFET+ process. The UltraScale+ portfolio includes FPGAs, 3D IC technology, and MPSoCs, combining new memory, 3D - on 3D and multiprocessing SoC technologies. With this portfolio, Xilinx addresses a broad range of next generation applications, including LTE Advanced and early 5G Wireless infrastructure, terabit wired communications, automotive, and the industrial Internet-of-things (IoT). These devices deliver an ASIC-class advantage, based on the UltraScale architecture and utilizing TSMC's 20SoC gate density process. These devices deliver next generation routing, ASIC-like clocking, and enhancements to logic and fabric to eliminate interconnect bottlenecks while supporting consistent device utilization of more than 90% without performance degradation. Kintex UltraScale FPGAs represent the Company’s second generation mid-range FPGA family. These devices offer high price-performance at the lowest power. Kintex UltraScale devices are designed to meet the requirements for the growing number of key applications including next generation wired and wireless communications and ultra-high definition displays and equipment. Virtex UltraScale devices provide advanced levels of performance, system integration and bandwidth on a single chip. The largest family member delivers 4.4M logic cells, more than doubling Xilinx's industry's highest capacity device and delivering 50M equivalent ASIC gates. Virtex UltraScale devices are expected to be used in the industry’s most challenging applications including: 400G communication applications, high performance computing, intelligence surveillance and reconnaissance systems and ASIC emulation and prototyping. Virtex-7 FPGAs, including 3D ICs, are optimized for applications requiring the highest capacity, performance, DSP and serial connectivity with transceivers operating up to 28G. Target applications include 400G and 100G line cards, high-performance computing and test and measurement applications. Kintex-7 FPGAs represent Xilinx’s first mid-range FPGA family. These devices maximize price-performance and performance per watt. Target applications include wireless LTE infrastructure, video display technology and medical imaging. Artix-7 FPGAs offer the lowest power and system cost at higher performance than alternative high volume FPGAs. These devices are targeted to high volume applications such as handheld portable ultrasound devices, multi-function printers and software defined radios. The Zynq-7000 family is the first family of Xilinx programmable SoCs. This new class of product combines an industry-standard ARM dual-core Cortex™-A9 MPCore™ processing system with Xilinx 28nm architecture. There are five devices in the Zynq-7000 SoC family that allow designers to target cost sensitive as well as high-performance applications from a single platform using industry-standard tools. These devices are designed to enable incremental market opportunities in applications such as industrial motor control, driver assistance and smart surveillance systems, and smart heterogeneous wireless networks. The Virtex-6 FPGA family consists of 13 devices and is the sixth generation in the Virtex series of FPGAs. Virtex-6 FPGAs are fabricated on a high-performance 40nm process technology. There are three Virtex-6 families, and each is optimized to deliver different feature mixes to address a variety of markets. The latest generation in the Spartan FPGA series, the Spartan-6 FPGA family, is fabricated on a low-power 45nm process technology. The Spartan-6 family is the PLD industry’s only 45nm high-volume FPGA family, consisting of 11 devices in two product families. Prior generation Virtex families include Virtex-5, Virtex-4, Virtex-II Pro, Virtex-II, Virtex-E and the original Virtex family. Spartan family FPGAs include 90nm Spartan-3 FPGAs, the Spartan-3E family and the Spartan-3A family. Prior generation Spartan families include Spartan-IIE, Spartan-II, Spartan XL and the original Spartan family. CPLDs operate on the lowest end of the programmable logic density spectrum. CPLDs are single-chip, nonvolatile solutions characterized by instant-on and universal interconnect. CPLDs combine the advantages of ultra-low power consumption with the benefits of high performance and low cost. Prior generations of CPLDs include the CoolRunnerTM and XC9500 product families. EasyPath FPGAs offer customers a fast, simple method of cost-reducing FPGA designs. EasyPath FPGAs use the same production masks and fabrication process as standard FPGAs and are tested to a specific customer application to improve yield and lower costs. As a result, EasyPath FPGAs provide customers with significant cost reduction when compared to the standard FPGA devices without the conversion risk, engineering effort, or the additional time required to move to an ASIC. The latest generation of EasyPath FPGAs and EasyPath-7 FPGAs provide lower total product cost of ownership for cost-reducing high performance FPGAs. The Base Platform is the delivery vehicle for all of our new silicon offerings used to develop and run customer-specific software applications and hardware designs. Released at launch, the Base Platform is comprised of: FPGA silicon; Vivado® Design Suite design environment; integration support for optional third-party synthesis, simulation, and signal integrity tools; reference designs; development boards and IP. signal, video, DSP and connectivity; domain-specific development hardware and reference designs; and operating systems and software. The Market-Specific Platform enables software or hardware developers to quickly build and run their specific application or solution. Built for specific markets such as automotive, consumer, aerospace and defense, communications, audio, video and broadcast, industrial, or scientific and medical, the Market-Specific Platform integrates both the Base and Domain-Specific Platforms with higher targeted applications elements such as IP, reference designs and boards optimized for a particular market. To accommodate the various design methodologies and design flows employed by the wide range of our customers’ user profiles such as system designers, algorithm designers, software coders and logic designers, we provide the appropriate design environment tailored to each user profile for design creation, design implementation and design verification. In April 2012, Xilinx introduced the next-generation Vivado Design Suite designed to improve developer productivity resulting in faster design integration and implementation. The Vivado Design Suite hallmarks include an easy-to-use IP-centric design flow and significant improvement in run times. The standards-based Vivado tools include high-level synthesis to provide a more direct flow in retargeting DSPs and general purpose processor designs into our FPGAs, IP Integrator to rapidly stitch together cores at higher levels of abstraction, and a new analytical place-and-route engine which significantly improves run times. The Vivado Design Suite supports Xilinx 7 series FPGAs and Zynq-7000, our programmable SoCs, as well as the Ultrascale-product generation. The previous generation tool suite, the ISE® Design Suite, supports Xilinx 7 series FPGAs, programmable SoCs and all previous generation FPGAs, enabling customers to transition to the Vivado Design Suite when the timing is right for their design needs. Both the Vivado Design Suite and ISE Design Suite operate with a wide range of third-party Electronic Design Automation software point-tools offerings. Within the past year, Xilinx also introduced the SDx development environment, which will significantly expand the Xilinx user base to include the broad community of systems and software engineers in both existing and new markets. This innovative development environment also enables end user and third party platform developers to rapidly define, integrate, and verify system level solutions and provide their end customers with a customized programming environment. Xilinx and various third parties offer hundreds of no charge and fee-bearing IP core licenses covering Ethernet, memory controllers, Interlaken and PCIe® interfaces, as well as an abundance of domain-specific IP in the areas of embedded, DSP and connectivity, and market-specific IP cores. In addition, our products and technology leverage industry standards such as ARM AMBA® AXI-4 interconnect technology, IP-XACT and IEEE P1735 encryption to facilitate plug-and-play FPGA design and take advantage of the large ecosystem of ARM IP developers. In addition to the broad selection of legacy development boards presently offered, we have introduced a new unified board strategy that enables the creation of a standardized and coordinated set of base boards available both from Xilinx and our ecosystem vendors, all utilizing the industry-standard extensions that enable customization for market specific applications. Adopting this standard for all of our base boards enables the creation of a scalable and extensible delivery mechanism for all Xilinx programmable platforms. We also offer comprehensive development kits including hardware, design tools, IP and reference designs that are designed to streamline and accelerate the development of domain-specific and market-specific applications. Finally, Xilinx offers a range of configuration products including one-time programmable and in-system programmable storage devices to configure Xilinx FPGAs. These programmable read-only memory (PROM) products support all of our FPGA devices. Xilinx and certain third parties have developed and continue to offer a robust ecosystem of IP, boards, tools, services and support through the Xilinx alliance program. Xilinx also works with these third parties to promote our programmable platforms through third-party tools, IP, software, boards and design services. Xilinx engineering services provide customers with engineering resources to augment their design teams and to provide expert design-specific advice. Xilinx tailors its engineering services to the needs of its customers, ranging from hands-on training to full design creation and implementation. Our research and development (R&D) activities are primarily directed toward the design of new ICs, the development of new software design automation tools for hardware and embedded software, the design of logic IP, the adoption of advanced semiconductor manufacturing processes for ongoing cost reductions, performance and signal integrity improvements and lowering PLD power consumption. As a result of our R&D efforts, we have introduced a number of new products during the past several years including the Virtex UltraScale, Kintex UltraScale, Virtex-7, Kintex-7, Artix-7 and Zynq-7000 families. We have made enhancements to our IP core offerings and introduced Vivado tools, our next generation software design suite. Collaboration with our foundry suppliers in the development of new process technology has enabled us to be the first company in the PLD industry to ship 45nm high-volume as well as 28nm and 20nm FPGA devices. Additionally, our investment in R&D has allowed us to ship the industry’s first 28nm with embedded ARM technology as well as the industry’s first 3D IC devices. Our R&D challenge is to continue to develop new products that create value-added solutions for customers. In fiscal 2015, 2014 and 2013, our R&D expenses were $525.7 million, $492.4 million and $475.5 million, respectively. We believe technical leadership and innovation are essential to our future success and are committed to maintaining a significant level of R&D investment. We sell our products to OEMs, EMSs and to electronic components distributors who resell these products to OEMs and EMSs. We use a dedicated global sales and marketing organization as well as independent sales representatives to generate sales. In general, we focus our direct demand creation efforts on a limited number of key accounts. Distributors and independent sales representatives create demand within the balance of our customer base in defined territories. Distributors also provide inventory, value-added services and logistics for a wide range of our OEM customers. Whether Xilinx, the independent sales representative, or the distributor identifies the sales opportunity, a local distributor will process and fulfill the majority of all customer orders. In such situations, distributors are the sellers of the products and as such they bear all legal and financial risks generally related to the sale of commercial goods, including such risks as credit loss, inventory shrinkage, theft and foreign currency fluctuations, but excluding indemnity and warranty liability. In accordance with our distribution agreements and industry practice, we have granted our authorized distributors the contractual right to return certain amounts of unsold product on a periodic basis and also receive price adjustments for unsold product in the case of a change in list prices subsequent to the initial sale. Revenue recognition on shipments to distributors worldwide is deferred until the products are sold to the distributors’ end customers. Avnet, Inc. (Avnet) distributes the substantial majority of our products worldwide. As of March 28, 2015 and March 29, 2014, Avnet accounted for 67% and 55%, respectively, of our total net accounts receivable. Resale of product through Avnet accounted for 43%, 46% and 46% of our worldwide net revenues in fiscal 2015, 2014 and 2013, respectively. We also use other regional distributors throughout the world. We believe distributors provide a cost-effective means of reaching a broad range of customers while providing efficient logistics services. Since PLDs are standard products, they do not carry many of the inventory risks posed by ASICs, and they simplify the requirements for distributor technical support. From time to time, we may add or terminate distributors in specific geographies, or move customers to a direct fulfillment model as we deem appropriate given our strategies, the level of distributor business activity and distributor performance and financial condition. See "Note 2. Summary of Significant Accounting Policies and Concentrations of Risk" to our consolidated financial statements, included in Item 8. "Financial Statements and Supplementary Data," for information about concentrations of credit risk and "Note 16. Segment Information" for information about our revenues from external customers and domestic and international operations. No end customer accounted for more than 10% of our net revenues in fiscal 2015, 2014 or 2013.
result, backlog from both OEM customers and end customers reported by our distributors as of any particular period may not be a reliable indicator of revenue for any future period. As a fabless semiconductor company, we do not manufacture wafers used for our IC products or PROMs. Rather, we purchase our wafers from independent foundries including United Microelectronics Corporation (UMC), TSMC, and Samsung Electronics Co., Ltd. (Samsung). Currently, UMC manufactures the majority of our wafers and TSMC manufactures the wafers for our newest products. Precise terms with respect to the volume and timing of wafer production and the pricing of wafers produced by the semiconductor foundries are determined by periodic negotiations with each wafer foundry. Our strategy is to focus our resources on market development and creating new ICs and software design tools rather than on wafer fabrication. We continuously evaluate opportunities to enhance foundry relationships and/or obtain additional capacity from our main suppliers as well as other suppliers of wafers manufactured with leading-edge process technologies, and we adjust loadings at particular foundries to meet our business needs. Wafers are sorted by the foundry or independent sort subcontractors. Sorted die are assembled by subcontractors. During the assembly process, the wafers are separated into individual die, which are then assembled into various package types. Following assembly, the packaged units are generally tested by independent test subcontractors or by Xilinx personnel. We purchase most of our assembly and some of our test services from Siliconware Precision Industries Ltd. in Taiwan and Amkor Technology, Inc. in Korea and the Philippines. We purchase most of our test services from King Yuan Electronics Company in Taiwan. Xilinx has achieved and currently maintains quality management systems certification to TL9000/ISO9001 for our facilities in San Jose, California; Longmont, Colorado; Singapore and Hyderabad, India. In addition, Xilinx achieved and currently maintains ISO 14001 and OHSAS 18001 environmental health and safety management system certifications in the San Jose and Singapore locations. While our various proprietary intellectual property rights are important to our success, we believe our business as a whole is not materially dependent on any particular patent or license, or any particular group of patents or licenses. As of March 28, 2015, we held over 3,300 issued United States (U.S.) patents, which vary in duration, and over 300 pending U.S. patent applications relating to our proprietary technology. We maintain an active program of filing for additional patents in the areas of, but not limited to, circuits, software, IC architecture, IP cores, system design, testing methodologies and other technologies relating to our products and business. We have licensed some parties to certain portions of our patent portfolio and obtained licenses to certain third-party patents as well. We have acquired various licenses from third parties to certain technologies that are implemented in IP cores or embedded in our PLDs, such as processors. Those licenses support our continuing ability to make and sell these PLDs to our customers. We also have acquired various licenses to certain third-party proprietary software, open-source software and related technologies, such as compilers, for our design tools. Continued use of such software and technology is important to the operation of the design tools upon which customers depend. We maintain the Xilinx trade name and trademarks, including the following trademarks that are registered in the U.S. and other countries: Xilinx, the Xilinx logo, Artix, ISE, Kintex, Spartan, Virtex, Vivado and Zynq. Maintaining these trademarks, and the goodwill associated with them, is important to our business. We have also obtained the rights to use certain trademarks owned by consortiums and other trademark owners that are related to our products and business. We intend to continue to protect our IP rights (including, for example, patents, copyrights and trademarks) vigorously. We believe that failure to enforce our intellectual property rights or failure to protect our trade secrets effectively could have an adverse effect on our financial condition and results of operations. We incurred, and in the future we may continue to incur, litigation expenses to defend against claims of infringement and to enforce our intellectual property rights against third parties. However, any such litigation may or may not be successful. We strive to meet or exceed industry and regulatory standards for ethical business practices, product responsibility, and supplier management. All of Xilinx’s directors, officers and employees are required to comply not only with the letter of the laws, rules and regulations that govern the conduct of our business, but also with the spirit of those laws. We monitor regulatory and resource trends and are committed to setting focused targets for key resources and emissions. These targets address several parameters, including product design; chemical, energy, and water use; waste recycling; and emissions. As a company, we focus on reducing natural resource use, the solid and chemical waste of our operations and minimizing our overall environmental impact with regards to the communities around us and consistent with global climate change efforts. We are committed to growing strategic relationships with a wide range of local organizations and programs that are designed to develop and strengthen communities located around the world. Xilinx develops local community relationships at key sites through funding and involvement that encourages active participation, teamwork, and volunteerism. Xilinx supports opportunities initiated by its employees and that involve participation and empowerment of its employees. We are committed to charitable giving programs that work toward systemic change and measurable results. We provide a safe and healthy work environment where employee diversity is embraced and opportunities for training, growth, and advancement are strongly encouraged. The Xilinx Code of Social Responsibility outlines standards to ensure that working conditions at Xilinx are safe and that workers are treated with respect, fairness and dignity. As of March 28, 2015, we had 3,451 employees compared to 3,500 as of the end of the prior fiscal year. None of our employees are represented by a labor union. We have not experienced any work stoppages and believe we maintain good employee relations. There are no family relationships among the executive officers of the Company or the Board of Directors. Moshe N. Gavrielov joined the Company in January 2008 as President and CEO and was appointed to the Board of Directors in February 2008. Prior to joining the Company, Mr. Gavrielov served at Cadence Design Systems, Inc., an electronic design automation company, as Executive Vice President and General Manager of the Verification Division from April 2005 through November 2007. Mr. Gavrielov served as CEO of Verisity Ltd., an electronic design automation company, from March 1998 to April 2005 before its acquisition by Cadence Design Systems, Inc. Prior to joining Verisity, Mr. Gavrielov spent nearly 10 years at LSI Corporation (formerly LSI Logic Corporation), a semiconductor manufacturer, in a variety of executive management positions, including Executive Vice President of the Products Group, Senior Vice President and General Manager of International Marketing and Sales and Senior Vice President and General Manager of LSI Logic Europe plc. Additionally, Mr. Gavrielov held various engineering and engineering management positions at Digital Equipment Corporation and National Semiconductor Corporation. Steven L. Glaser joined the Company in January 2011 as Corporate Vice President, Strategic Planning. In April 2012, Mr. Glaser was promoted to his current position of Senior Vice President, Corporate Strategy and Marketing. Prior to joining the Company, Mr. Glaser held various senior positions in Cadence Design Systems between April 2005 and January 2011, including Corporate Vice President of Strategic Development and Corporate Vice President of Marketing for the Verification Division. From June 2003 to April 2005, he served as Senior Vice President of Marketing at Verisity Ltd. Prior to that, Mr. Glaser held various senior business and technical positions at companies in the semiconductor and electronic design automation industries. Scott R. Hover-Smoot joined the Company in October 2007 and currently serves as Senior Vice President, General Counsel and Secretary, a position he has held since May 2014. From October 2007 to May 2014, Mr. Hover-Smoot served as Corporate Vice President, General Counsel and Secretary. From November 2001 to October 2007, Mr. Hover-Smoot served as Regional Counsel and Director of Legal Operations with TSMC, an independent semiconductor foundry. He served as Vice President and General Counsel of California Micro Devices Corporation, a provider of application-specific protection devices and display electronics devices from June 1994 to November 2001. Prior to joining California Micro Devices Corporation, Mr. Hover-Smoot spent over 20 years working in law firms including Berliner-Cohen, Flehr, Hohbach, Test, Albritton & Herbert and Lyon & Lyon. Jon A. Olson joined the Company in June 2005 and currently serves as Executive Vice President and CFO, a position he has held since May 2014. From August 2006 to May 2014, Mr. Olson served as Senior Vice President, Finance and CFO. From June 2005 to August 2006, he served as Vice President, Finance and CFO. Prior to joining the Company, Mr. Olson spent more than 25 years at Intel Corporation, a semiconductor chip maker, serving in a variety of positions, including Vice President, Finance and Enterprise Services, and Director of Finance. Victor Peng joined the Company in April 2008 and currently serves as Executive Vice President and General Manager of Products, a position he has held since July 2014. From May 2013 through April 2014, Mr. Peng served as Senior Vice President and General Manager of the Programmable Platforms Group. From May 2012 through April 2013, he served as Senior Vice President of the Programmable Platforms Group. From November 2008 through April 2012, he served as Senior Vice President of the Programmable Platforms Development Group. Prior to joining the Company, Mr. Peng served as Corporate Vice President, Graphics Products Group at Advanced Micro Devices (AMD), a provider of processing solutions, from November 2005 to April 2008. Prior to joining AMD, Mr. Peng served in a variety of executive engineering positions at companies in the semiconductor and processor industries. Krishna Rangasayee joined the Company in July 1999 and currently serves as Senior Vice President, and General Manager, Global Sales and Markets, a position he has held since January 2015. Prior to that, he served in a number of key roles, including as Senior Director of Vertical Markets and Partnerships from November 2005 through June 2008. He then served as the Vice President of Strategic Planning from July 2008 through September 2010 and was promoted to the rank of Corporate Vice President for the same function. Mr. Rangasayee assumed the position of Corporate Vice President and General Manager, Communications Business Unit in October 2010. Mr. Rangasayee was promoted to the position of Senior Vice President, and General Manager, Communications Business Unit in April 2012. He became Senior Vice President, and General Manager, Market Segments and Communications Business Unit in October 2013. Prior to joining Xilinx, Mr. Rangasayee held various positions at Altera, a provider of programmable logic solutions, and Cypress Semiconductor, a semiconductor company. Vincent L. Tong joined the Company in May 1990 and currently serves as Senior Vice President, Global Operations and Quality, a position he has held since January 2015, and Executive Leader, Asia Pacific since October 2011. Mr. Tong previously served as Senior Vice President, Worldwide Quality and New Product Introductions from June 2008 to January 2015. He has also served as Vice President, Worldwide Quality and Reliability from August 2006 to June 2008 and prior to that as Vice President of Product Technology from May 2001 to July 2006. Prior to joining the Company, Mr. Tong served in a variety of engineering and management positions at Monolithic Memories, a producer of logic devices, and AMD. He holds seven U.S. patents. We make available, via a link through our investor relations website located at www.investor.xilinx.com, access to our Annual Report on Form 10-K, quarterly reports on Form 10-Q, current reports on Form 8-K and any amendments to those reports filed or furnished pursuant to Section 13(a) or 15(d) of the U.S. Securities Exchange Act of 1934, as amended (Exchange Act) as soon as reasonably practicable after they are electronically filed with or furnished to the Securities and Exchange Commission (SEC). All such filings on our investor relations website are available free of charge. Printed copies of these documents are also available to stockholders without charge, upon written request directed to Xilinx, Inc., Attn: Investor Relations, 2100 Logic Drive, San Jose, CA 95124. Further, a copy of this Annual Report on Form 10-K is located at the SEC’s Public Reference Room at 100 F Street, N.E., Washington, D.C. 20549. Information on the operation of the Public Reference Room can be obtained by calling the SEC at 1-800-SEC-0330. The SEC maintains an Internet site that contains reports, proxy and information statements and other information regarding our filings at http://www.sec.gov. The content on any website referred to in this filing is not incorporated by reference into this filing unless expressly noted otherwise. Additional information required by this Item 1 is incorporated by reference to the section captioned "Net Revenues - Net Revenues by Geography" in Item 7. "Management’s Discussion and Analysis of Financial Condition and Results of Operations" and to "Note 16. Segment Information" to our consolidated financial statements, included in Item 8. "Financial Statements and Supplementary Data." This annual report includes trademarks and service marks of Xilinx and other companies that are unregistered and registered in the U.S. and other countries. The following risk factors and other information included in this Annual Report on Form 10-K should be carefully considered. The risks and uncertainties described below are not the only risks to the Company. Additional risks and uncertainties not presently known to the Company, or that the Company’s management currently deems immaterial, also may impair its business operations. If any of the risks described below were to occur, our business, financial condition, operating results and cash flows could be materially adversely affected. Our success depends on our ability to develop and introduce new products and failure to do so would have a material adverse impact on our financial condition and results of operations. market acceptance of our customers’ products. Our product development efforts may not be successful, our new products may not achieve industry acceptance and we may not achieve the necessary volume of production that would lead to further per unit cost reductions. Revenues relating to our mature products are expected to decline in the future, which is normal for our product life cycles. As a result, we may be increasingly dependent on revenues derived from design wins for our newer products as well as anticipated cost reductions in the manufacture of our current products. We rely primarily on obtaining yield improvements and corresponding cost reductions in the manufacture of existing products, and on introducing new products that incorporate advanced features and other price/performance factors that enable us to increase revenues while maintaining consistent margins. To the extent that such cost reductions and new product introductions do not occur in a timely manner, or to the extent that our products do not achieve market acceptance at prices with higher margins, our financial condition and results of operations could be materially adversely affected. We rely on independent foundries for the manufacture of all of our products and a manufacturing problem or insufficient foundry capacity could adversely affect our operations. Most of our wafers are manufactured in Taiwan by UMC and by TSMC for our newest products. In addition, we also have wafers manufactured in South Korea by Samsung Electronics Co., Ltd. Terms with respect to the volume and timing of wafer production and the pricing of wafers produced by the semiconductor foundries are determined by periodic negotiations between Xilinx and these wafer foundries, which usually result in short-term agreements that do not provide for long-term supply or allocation commitments. We are dependent on these foundries to supply the substantial majority of our wafers. We rely on UMC, TSMC and our other foundries to produce wafers with competitive performance attributes. Therefore, the foundries, particularly TSMC who manufactures our newest products, must be able to transition to advanced manufacturing process technologies and increased wafer sizes, produce wafers at acceptable yields and deliver them in a timely manner. Furthermore, we cannot guarantee that the foundries that supply our wafers will offer us competitive pricing terms or other commercial terms important to our business. We cannot guarantee that our foundries will not experience manufacturing problems, including delays in the realization of advanced manufacturing process technologies or difficulties due to limitations of new and existing process technologies. Furthermore, we cannot guarantee the foundries will be able to manufacture sufficient quantities of our products or that they will continue to manufacture a product for the full life of the product. In addition, weak economic conditions may adversely impact the financial health and viability of the foundries and result in their insolvency or their inability to meet their commitments to us. For example, we may experience supply shortages due to the difficulties foundries may encounter if they must rapidly increase their production capacities from low utilization levels to high utilization levels because of an unexpected increase in demand. We may also experience supply shortages due to very strong demand for our products and a surge in demand for semiconductors in general, which may lead to tightening of foundry capacity across the industry. The insolvency of a foundry or any significant manufacturing problem or insufficient foundry capacity would disrupt our operations and negatively impact our financial condition and results of operations. General economic conditions and any related deterioration in the global business environment could have a material adverse effect on our business, operating results and financial condition. During the past five years, global consumer confidence eroded amidst concerns over declining asset values, inflation, volatility in energy costs, geopolitical issues, the availability and cost of credit, rising unemployment, and the stability and solvency of financial institutions, financial markets, businesses and sovereign nations, among other concerns. These concerns slowed global economic growth and resulted in recessions in numerous countries, including many of those in North America, Europe and Asia. The financial condition of certain sovereign nations, particularly in Europe, is of continuing concern as the sovereign debt crisis remains unresolved. These weak economic conditions resulted in reduced customer demand and had a negative impact on our results of operations for the second and third quarter of fiscal 2012 and the third quarter of fiscal 2013. If weak economic conditions return, there may be a number of negative effects on our business, including customers or potential customers reducing or delaying orders, the insolvency of key suppliers, potentially causing production delays, the inability of customers to obtain credit, and the insolvency of one or more customers. Any of these effects could impact our ability to effectively manage inventory levels and collect receivables and ultimately decrease our net revenues and profitability. The semiconductor industry is characterized by cyclical market patterns and a significant industry downturn could adversely affect our operating results. The semiconductor industry is highly cyclical and our financial performance has been affected by downturns in the industry. Down cycles are generally characterized by price erosion and weaker demand for our products. Weaker demand for our products resulting from economic conditions in the end markets we serve and reduced capital spending by our customers can result, and in the past has resulted, in excess and obsolete inventories and corresponding inventory write-downs. We attempt to identify changes in market conditions as soon as possible; however, the dynamics of the market in which we operate make prediction of and timely reaction to such events difficult. Due to these and other factors, our past results are not reliable predictors of our future results. The nature of our business makes our revenues difficult to predict which could have an adverse impact on our business. In addition to the challenging market conditions we may face, we have limited visibility into the demand for our products, particularly new products, because demand for our products depends upon our products being designed into our end customers’ products and those products achieving market acceptance. Due to the complexity of our customers’ designs, the design to volume production process for our customers requires a substantial amount of time, frequently longer than a year. In addition to this, other factors may affect our end customers’ demand for our products, including, but not limited to, end customer program delays and the ability of end customers to secure other complimentary products. We also are dependent upon "turns," orders received and turned for shipment in the same quarter. These factors make it difficult for us to forecast future sales and project quarterly revenues. The difficulty in forecasting future sales impairs our ability to project our inventory requirements, which could result, and in the past has resulted, in inventory write-downs or failure to meet customer product demands in a timely manner. In addition, difficulty in forecasting revenues compromises our ability to provide forward-looking revenue and earnings guidance. If we are not able to compete successfully in our industry, our financial results and future prospects will be adversely affected. Our strategy for expansion in the logic market includes continued introduction of new product architectures that address high-volume, low-cost and low-power applications as well as high-performance, high-density applications. However, we may not be successful in executing this strategy. In addition, we anticipate continued pressure from our customers to reduce prices, which may outpace our ability to lower the cost for established products. Several companies have introduced products that compete with ours or have announced their intention to sell PLD products. To the extent that our efforts to compete are not successful, our financial condition and results of operations could be materially adversely affected. The benefits of programmable logic have attracted a number of competitors to this segment. We recognize that different applications require different programmable technologies, and we are developing architectures, processes and products to meet these varying customer needs. Recognizing the increasing importance of standard software solutions, we have developed common software design tools that support the full range of our IC products. We believe that automation and ease of design are significant competitive factors in this segment. We could also face competition from our licensees. In the past we have granted limited rights to other companies with respect to certain aspects of our older technology, and we may do so in the future. Granting such rights may enable these companies to manufacture and market products that may be competitive with some of our older products. Increased costs of wafers and materials, or shortages in wafers and materials, could adversely impact our gross margins and lead to reduced revenues. If greater demand for wafers is not offset by an increase in foundry capacity, market demand for wafers or production and assembly materials increases, or if a supplier of our wafers or other materials ceases or suspends operations, our supply of wafers and other materials could become limited. Such shortages raise the likelihood of potential wafer price increases, wafer shortages or shortages in materials at production and test facilities, resulting in potential inability to address customer product demands in a timely manner. For example, when certain suppliers were forced to temporarily halt production as the result of a natural disaster, this resulted in a tightening of supply for those materials. Such shortages of wafers and materials as well as increases in wafer or materials prices could adversely affect our gross margins and would adversely affect our ability to meet customer demands and lead to reduced revenue. We depend on distributors, primarily Avnet, to generate a majority of our sales and complete order fulfillment. Resale of product through Avnet accounted for 43% of our worldwide net revenues in fiscal 2015 and as of March 28, 2015, Avnet accounted for 67% of our total net accounts receivable. Any adverse change to our relationship with Avnet or our remaining distributors could have a material impact on our business. Furthermore, if a key distributor materially defaults on a contract or otherwise fails to perform, our business and financial results would suffer. In addition, we are subject to concentrations of credit risk in our trade accounts receivable, which includes accounts of our distributors. A significant reduction of effort by a distributor to sell our products or a material change in our relationship with one or more distributors may reduce our access to certain end customers and adversely affect our ability to sell our products. In addition, the financial health of our distributors and our continuing relationships with them are important to our success. Unpredictable economic conditions may adversely impact the financial health of some of these distributors, particularly our smaller distributors. This could result in the insolvency of certain distributors, the inability of distributors to obtain credit to finance the purchase of our products, or cause distributors to delay payment of their obligations to us and increase our credit risk exposure. Our business could be harmed if the financial health of these distributors impairs their performance and we are unable to secure alternate distributors. We are dependent on independent subcontractors for most of our assembly and test services, and unavailability or disruption of these services could negatively impact our financial condition and results of operations. We are dependent on subcontractors to provide semiconductor assembly, substrate, test and shipment services. Any prolonged inability to obtain wafers with competitive performance and cost attributes, adequate yields or timely delivery, any disruption in assembly, test or shipment services, delays in stabilizing manufacturing processes and ramping up volume for new products, transitions to new service providers or any other circumstance that would require us to seek alternative sources of supply, could delay shipments and have a material adverse effect on our ability to meet customer demands. In addition, unpredictable economic conditions may adversely impact the financial health and viability of these subcontractors and result in their insolvency or their inability to meet their commitments to us. These factors would result in reduced net revenues and could negatively impact our financial condition and results of operations. A number of factors, including our inventory strategy, can impact our gross margins. A number of factors, including yield, wafer pricing, product mix, market acceptance of our new products, competitive pricing dynamics, geographic and/or market segment pricing strategies can cause our gross margins to fluctuate. In addition, forecasting our gross margins is difficult because a significant portion of our business is based on turns within the same quarter. Our current inventory levels are higher than historical norms due to weaker than anticipated sales and a planned increase in safety stock across newer technologies in anticipation of future revenue growth. In the event demand does not materialize, we may be subject to incremental obsolescence costs. In addition, future product cost reductions could have an increased impact on our inventory valuation, which would then impact our operating results. Reductions in the average selling prices of our products could have a negative impact on our gross margins. The average selling prices of our products generally decline as the products mature. We seek to offset the decrease in selling prices through yield improvement, manufacturing cost reductions and increased unit sales. We also continue to develop higher value products or product features that increase, or slow the decline of, the average selling price of our products. However, there is no guarantee that our ongoing efforts will be successful or that they will keep pace with the decline in selling prices of our products, which could ultimately lead to a decline in revenues and have a negative effect on our gross margins. Because of our international business and operations, we are vulnerable to the economic conditions of the countries in which we operate and currency fluctuations could have a material adverse effect on our business and negatively impact our financial condition and results of operations. are increasingly dependent on the global economy, instability in worldwide economic environments occasioned, for example, directly or indirectly by political instability, terrorist activity, U.S. or other military actions, and international sanctions or other diplomatic actions (potentially including sanctions adopted or under consideration by the U.S. or European Union with respect to Russia or Russian individuals or businesses), could adversely impact economic activity and lead to a contraction of capital spending by our customers generally or in specific regions. Any or all of these factors could adversely affect our financial condition and results of operations in the future. We are subject to the risks associated with conducting business operations outside of the U.S. which could adversely affect our business. In addition to international sales and support operations and development activities, we purchase our wafers from foreign foundries, have our commercial products assembled, packaged and tested by subcontractors located outside the U.S. and utilize third party warehouse operators to store and manage inventory levels for certain of our products. All of these activities are subject to the uncertainties associated with international business operations, including global laws and regulations, trade barriers, economic sanctions, tax regulations, import and export regulations, duties and tariffs and other trade restrictions, changes in trade policies, anti-corruption laws, foreign governmental regulations, potential vulnerability of and reduced protection for IP, longer receivable collection periods and disruptions or delays in production or shipments, any of which could have a material adverse effect on our business, financial condition and/or operating results. Additional factors that could adversely affect us due to our international operations include rising oil prices and increased costs of natural resources. Moreover, our financial condition and results of operations could be affected in the event of political conflicts or economic crises in countries where our main wafer providers, warehouses, end customers and contract manufacturers who provide assembly and test services worldwide, are located. Adverse change to the circumstances or conditions of our international business operations could have a material adverse effect on our business. We are exposed to fluctuations in interest rates and changes in credit rating and in the market values of our portfolio investments which could have a material adverse impact on our financial condition and results of operations. Our cash, short-term and long-term investments represent significant assets that may be subject to fluctuating or even negative returns depending upon interest rate movements, changes in credit rating and financial market conditions. Global credit market disruptions and economic slowdown and uncertainty have in the past negatively impacted the values of various types of investment and non-investment grade securities. The global credit and capital markets may again experience significant volatility and disruption due to instability in the global financial system, uncertainty related to global economic conditions and concerns regarding sovereign financial stability. Therefore, there is a risk that we may incur other-than-temporary impairment charges for certain types of investments should credit market conditions deteriorate or the underlying assets fail to perform as anticipated. Our future investment income may fall short of expectations due to changes in interest rates or if the decline in fair values of our debt securities is judged to be other than temporary. Furthermore, we may suffer losses in principal if we are forced to sell securities that have declined in market value due to changes in interest rates or financial market conditions. Our failure to protect and defend our IP could impair our ability to compete effectively. We rely upon patent, copyright, trade secret, mask work and trademark laws to protect our IP. We cannot provide assurance that such IP rights can be successfully asserted in the future or will not be invalidated, violated, circumvented or challenged. From time to time, third parties, including our competitors, have asserted against us patent, copyright and other IP rights to technologies that are important to us. Third parties may attempt to misappropriate our IP through electronic or other means or assert infringement claims against our indemnities or us in the future. Such assertions by third parties may result in costly litigation, indemnity claims or other legal actions, and we may not prevail in such matters or be able to license any valid and infringed patents from third parties on commercially reasonable terms. This could result in the loss of our ability to import and sell our products or require us to pay costly royalties to third parties in connection with sales of our products. Any infringement claim, indemnification claim, or impairment or loss of use of our IP could materially adversely affect our financial condition and results of operations. Our ability to design and introduce new products in a timely manner is dependent upon third-party IP. In the design and development of new products and product enhancements, we rely on third-party intellectual property such as software development tools and hardware testing tools. Furthermore, certain product features may rely on intellectual property acquired from third parties. The design requirements necessary to meet future consumer demands for more features and greater functionality from semiconductor products may exceed the capabilities of the third-party intellectual property or development tools that are available to us. If the third-party intellectual property that we use becomes unavailable or fails to produce designs that meet consumer demands, our business could be adversely affected. We rely on information technology (IT) systems, and failure of these systems to function properly or unauthorized access to our systems could result in business disruption. We rely in part on various IT systems to manage our operations, including financial reporting, and we regularly evaluate these systems and make changes to improve them as necessary. Consequently, we periodically implement new, or upgrade or enhance existing, operational and IT systems, procedures and controls. For example, in the third quarter of fiscal 2012 we upgraded the IT systems we use to manage our operations and record and report financial information, and in the past we simplified our supply chain and were required to make certain changes to our IT systems. Any delay in the implementation of, or disruption in the transition to, new or enhanced systems, procedures or controls, could harm our ability to record and report financial and management information on a timely and accurate basis. These systems are also subject to power and telecommunication outages or other general system failures. Failure of our IT systems or difficulties in managing them could result in business disruption. We also may be subject to unauthorized access to our IT systems through a security breach or cyber attack. We experience cyber attacks of varying degrees on an ongoing basis. In the past there have been attempts by third parties to penetrate and/or infect our network and systems with malicious software, in an effort to gain access to our network and systems. Third parties may continue to attempt to fraudulently induce employees, users, or customers to disclose sensitive information in order to gain access to our networks systems. We seek to detect and investigate any security incidents and prevent their recurrence, but in some cases, we might be unaware of an incident or its magnitude and effects. Because the techniques used to obtain unauthorized access to and sabotage our systems change frequently, we may be unable to anticipate these techniques or to implement adequate protections. Our business could be significantly harmed and we could be subject to third party claims in the event of such a security breach. Earthquakes and other natural disasters could disrupt our operations and have a material adverse effect on our financial condition and results of operations. The independent foundries, upon which we rely to manufacture our products, as well as our California and Singapore facilities, are located in regions that are subject to earthquakes and other natural disasters. UMC’s and TSMC's foundries in Taiwan and our assembly and test partners in other regions as well as many of our operations in California are centered in areas that have been seismically active in the recent past and some areas have been affected by other natural disasters such as typhoons. Any catastrophic event in these locations will disrupt our operations, including our manufacturing activities and our insurance may not cover losses resulting from such disruptions of our operations. This type of disruption could result in our inability to manufacture or ship products, thereby materially adversely affecting our financial condition and results of operations. For example, as a result of the March 2011 earthquake in Japan, production at the Seiko foundry at Sakata was halted temporarily, impacting production of some of our older devices. In addition, suppliers of wafers and substrates were forced to halt production temporarily. Disruption of operations at these foundries for any reason, including other natural disasters such as typhoons, tsunamis, volcano eruptions, fires or floods, as well as disruptions in access to adequate supplies of electricity, natural gas or water could cause delays in shipments of our products, and could have a material adverse effect on our results of operations. Furthermore, natural disasters can also indirectly impact us. For example, our customers’ supply of other complimentary products may be disrupted by a natural disaster and may cause them to delay orders of our products. If we are unable to maintain effective internal controls, our stock price could be adversely affected. We are subject to the ongoing internal control provisions of Section 404 of the Sarbanes-Oxley Act of 2002 (the Act). Our controls necessary for continued compliance with the Act may not operate effectively at all times and may result in a material weakness disclosure. The identification of material weaknesses in internal control, if any, could indicate a lack of proper controls to generate accurate financial statements and could cause investors to lose confidence and our stock price to drop. We compete with others to attract and retain key personnel, and any loss of, or inability to attract, such personnel would harm us. We depend on the efforts and abilities of certain key members of management and other technical personnel. Our future success depends, in part, upon our ability to retain such personnel and attract and retain other highly qualified personnel, particularly product engineers. Competition for such personnel is intense and we may not be successful in hiring or retaining new or existing qualified personnel. From time to time we have effected restructurings which eliminate a number of positions. Even if such personnel are not directly affected by the restructuring effort, such terminations can have a negative impact on morale and our ability to attract and hire new qualified personnel in the future. If we lose existing qualified personnel or are unable to hire new qualified personnel, as needed, our business, financial condition and results of operations could be seriously harmed. Unfavorable results of legal proceedings could adversely affect our financial condition and operating results. and cause significant expense and diversion of management attention and we may enter into material settlements to avoid these risks. Should we fail to prevail in certain matters, or should several of these matters be resolved against us in the same reporting period, we may be faced with significant monetary damages or injunctive relief against us that would materially and adversely affect a portion of our business and might materially and adversely affect our financial condition and operating results. Our products could have defects which could result in reduced revenues and claims against us. We develop complex and evolving products that include both hardware and software. Despite our testing efforts and those of our subcontractors, defects may be found in existing or new products. These defects may cause us to incur significant warranty, support and repair or replacement costs, divert the attention of our engineering personnel from our product development efforts and harm our relationships with customers. Subject to certain terms and conditions, we have agreed to compensate certain customers for limited specified costs they actually incur in the event our hardware products experience epidemic failure. As a result, epidemic failure and other performance problems could result in claims against us, the delay or loss of market acceptance of our products and would likely harm our business. Our customers could also seek damages from us for their losses. In addition, we could be subject to product liability claims. A product liability claim brought against us, even if unsuccessful, would likely be time-consuming and costly to defend. Product liability risks are particularly significant with respect to aerospace, automotive and medical applications because of the risk of serious harm to users of these products. Any product liability claim, whether or not determined in our favor, could result in significant expense, divert the efforts of our technical and management personnel, and harm our business. In preparing our financial statements, we make good faith estimates and judgments that may change or turn out to be erroneous. In preparing our financial statements in conformity with accounting principles generally accepted in the U.S., we must make estimates and judgments in applying our most critical accounting policies. Those estimates and judgments have a significant impact on the results we report in our consolidated financial statements. The most difficult estimates and subjective judgments that we make concern valuation of marketable and non-marketable securities, revenue recognition, inventories, long-lived assets including acquisition-related intangibles, goodwill, taxes and stock-based compensation. We base our estimates on historical experience, input from outside experts and on various other assumptions that we believe to be reasonable under the circumstances, the results of which form the basis for making judgments about the carrying values of assets and liabilities that are not readily apparent from other sources. We also have other key accounting policies that are not as subjective, and therefore, their application would not require us to make estimates or judgments that are as difficult, but which nevertheless could significantly affect our financial reporting. Actual results may differ materially from these estimates. If these estimates or their related assumptions change, our operating results for the periods in which we revise our estimates or assumptions could be adversely and perhaps materially affected. Our failure to comply with the requirements of the Export Administration Regulations (EAR) and the International Traffic and Arms Regulations (ITAR) could have a material adverse effect on our financial condition and results of operations. Xilinx FPGAs and related technologies are subject to EAR, which are administered by the U.S. Department of Commerce. In addition, Xilinx may, from time to time, receive technical data from third parties that is subject to the ITAR, which are administered by the U.S. Department of State. EAR and ITAR govern the export and re-export of these FPGAs, the transfer of related technologies, whether in the U.S. or abroad, and the provision of services. We are required to maintain an internal compliance program and security infrastructure to meet EAR and ITAR requirements. An inability to obtain the required export licenses, or to predict when they will be granted, increases the difficulties of forecasting shipments. In addition, security or compliance program failures that could result in penalties or a loss of export privileges, as well as stringent licensing restrictions that may make our products less attractive to overseas customers, could have a material adverse effect on our business, financial condition and/or operating results. Our inability to effectively control the sale of our products on the gray market could have a material adverse effect on us. We market and sell our products directly to OEMs and through authorized third-party distributors which helps to ensure that products delivered to our customers are authentic and properly handled. From time to time, customers may purchase products bearing our name from the unauthorized "gray market." These parts may be counterfeit, salvaged or re-marked parts, or parts that have been altered, mishandled, or damaged. Gray market products result in shadow inventory that is not visible to us, thus making it difficult to forecast supply or demand. Also, when gray market products enter the market, we and our authorized distributors may compete with brokers of these discounted products, which can adversely affect demand for our products and negatively impact our margins. In addition, our reputation with customers may be negatively impacted when gray market products bearing our name fail or are found to be substandard. The conflict minerals provisions of the Dodd-Frank Wall Street Reform and Consumer Protection Act could result in additional costs and liabilities. In accordance with the Dodd-Frank Wall Street Reform and Consumer Protection Act, the SEC established disclosure and reporting requirements for those companies who use "conflict" minerals mined from the Democratic Republic of Congo and adjoining countries in their products, whether or not these products are manufactured by third parties. These requirements could affect the sourcing and availability of minerals used in the manufacture of our semiconductor products. There will also be costs associated with complying with the disclosure requirements, including for due diligence in regard to the sources of any conflict minerals used in our products, in addition to the cost of remediation and other changes to products, processes, or sources of supply as a consequence of such verification activities. We may face reputational challenges if we are unable to sufficiently verify the origins for all minerals used in our products through the due diligence process we implement. Moreover, we may encounter challenges to satisfy those customers who require that all of the components of our products are certified as conflict free. Exposure to greater than anticipated income tax liabilities, changes in tax rules and regulations, changes in interpretation of tax rules and regulations, or unfavorable assessments from tax audits could affect our effective tax rates, financial condition and results of operations. We are a U.S.-based multinational company subject to tax in multiple U.S. and foreign tax jurisdictions. Our income tax obligations could be affected by many factors, including but not limited to changes to our corporate operating structure, intercompany arrangements and tax planning strategies. A significant portion of our earnings are earned by our subsidiaries outside the U.S. In addition to providing for U.S. income taxes on earnings from the U.S., we provide for U.S. income taxes on the earnings of foreign subsidiaries unless the subsidiaries' earnings are considered permanently reinvested outside the U.S. While we do not anticipate changing our intention regarding permanently reinvested earnings, if certain foreign earnings previously treated as permanently reinvested are repatriated, the related U.S. tax on such repatriated earnings could negatively impact our effective tax rates, financial condition and results of operations. Our income tax expense is computed based on tax rates at the time of the respective financial period. Our future effective tax rates, financial condition and results from operations could be unfavorably affected by changes in the tax rates in jurisdictions where our income is earned, by changes in the tax rules and regulations or the interpretation of tax rules and regulations in the jurisdictions in which we do business, by lapses of the availability (or by the reintroduction, when such credit has lapsed) of the U.S. research and development tax credit, or by changes in the valuation of our deferred tax assets. In addition, we are subject to examinations of our income tax returns by the U.S. Internal Revenue Service and other domestic and foreign tax authorities. We regularly assess the likelihood of outcomes resulting from these examinations to determine the adequacy of our provision for income taxes and have reserved for potential adjustments that may result from the current examinations. There can be no assurance that the final determination of any of these examinations will not have an adverse effect on our effective tax rates, financial position and results of operations. The conditional conversion features of our 2.625% Senior Convertible Debentures due June 15, 2017 (2017 Convertible Notes) were triggered and holders of the 2017 Convertible Notes may elect to convert such 2017 Convertible Notes which could have a material effect on our liquidity. The 2017 Convertible Notes have conditional conversion features which were triggered in fiscal 2013. Holders of the 2017 Convertible Notes are entitled to convert the 2017 Convertible Notes at any time during specified periods at their option. As a result of this, we were required under applicable accounting rules to reclassify all or a portion of the outstanding principal of the 2017 Convertible Notes as a current rather than long-term liability. In addition, we were required to increase the number of shares used in our net income per share calculations to reflect the potentially dilutive impact of the conversion. If one or more holders elect to convert their 2017 Convertible Notes, we would be required to settle any converted principal through the payment of cash, which could adversely affect our liquidity. Considerable amounts of our common shares are available for issuance under our equity incentive plans and 2017 Convertible Notes, and significant issuances in the future may adversely impact the market price of our common shares. As of March 28, 2015 we had 2.00 billion authorized common shares, of which 258.3 million shares were outstanding. In addition, 36.0 million common shares were reserved for issuance pursuant to our equity incentive plans and Employee Stock Purchase Plan (ESPP), 20.0 million common shares were reserved for issuance upon conversion or repurchase of the 2017 Convertible Notes and 20.2 million common shares were reserved for issuance upon exercise of warrants. The availability of substantial amounts of our common shares resulting from the exercise or settlement of equity awards outstanding under our equity incentive plans or the conversion or repurchase of convertible debentures using common shares, which would be dilutive to existing stockholders, could adversely affect the prevailing market price of our common shares and could impair our ability to raise additional capital through the sale of equity securities. We have indebtedness that could adversely affect our financial condition and prevent us from fulfilling our debt obligations. require us to repatriate off-shore cash to the U.S. at unfavorable tax rates. Our ability to meet our debt service obligations will depend on our future performance, which will be subject to financial, business and other factors affecting our operations, many of which are beyond our control. The agreements governing the 2019 Notes and 2021 Notes contain covenants that may adversely affect our ability to operate our business. consolidate or merge with, or convey, transfer or lease all or substantially all our assets, taken as a whole, to, another person. A failure to comply with these covenants and other provisions in these indentures could result in events of default under the indentures, which could permit acceleration of the 2019 Notes and the 2021 Notes. Any required repayment as a result of such acceleration could have a material adverse effect on our business, results of operations, financial condition or cash flows. The call options and warrant transactions related to our 2017 Convertible Notes may affect the value of the debentures and our common stock. To hedge against potential dilution upon conversion of the 2017 Convertible Notes, we purchased call options on our common stock from the hedge counterparties. We also sold warrants to the hedge counterparties, which could separately have a dilutive effect on our earnings per share to the extent that the market price per share of our common stock exceeds the applicable strike price of the warrants of $41.99 per share. As the hedge counterparties and their respective affiliates modify hedge positions, they may enter or unwind various derivatives with respect to our common stock and/or purchase or sell our common stock in secondary market transactions. This activity also could affect the market price of our common stock and/or debentures, which could affect the ability of the holders of the debentures to convert and the number of shares and value of the consideration that will be received by the holders of the debentures upon conversion. Acquisitions and strategic investments present risks, and we may not realize the goals that were contemplated at the time of a transaction. we may experience unexpected changes in how we are required to account for our acquisitions and strategic investments pursuant to U.S. GAAP. The occurrence of any of these risks could have a material adverse effect on our business, results of operations, financial condition or cash flows, particularly in the case of a larger acquisition or several concurrent acquisitions or strategic investments. Our corporate offices, which include the administrative, sales, customer support, marketing, R&D and manufacturing and testing groups, are located in San Jose, California. This main site consists of adjacent buildings providing 588,000 square feet of space, which we own. We also own one parcel of land totaling approximately 84 acres in South San Jose near our corporate facility. At present, we do not have any plans to develop the land. We own a 228,000 square foot facility in the metropolitan area of Dublin, Ireland, which serves as our regional headquarters in Europe. The Irish facility is primarily used for service and support for our customers in Europe, R&D, marketing and IT support. We own a 222,000 square foot facility in Singapore, which serves as our Asia Pacific regional headquarters. We own the building but the land is subject to a 30-year lease expiring in November 2035. The Singapore facility is primarily used for manufacturing support and testing of our products and services for our customers in Asia Pacific/Japan, coordination and management of certain third parties in our supply chain and R&D. We own a 130,000 square foot facility in Longmont, Colorado. The Longmont facility serves as a primary location and data center for our software efforts in the areas of R&D, manufacturing and quality control. In addition, we own a 200,000 square foot facility and 40 acres of land adjacent to the Longmont facility for future expansion. The facility is partially leased to tenants under long-term lease agreements and partially used by us. We lease office facilities for our engineering design centers in Hyderabad, India; Portland, Oregon; Albuquerque, New Mexico; Edinburgh, Scotland; Ottawa, Canada; Beijing, China; Belfast, Northern Ireland; Cork, Ireland; Hazlet, New Jersey; Gothenberg, Sweden; Tallinn, Estonia and Brisbane, Australia. We also lease sales offices in various locations throughout North America, which include the metropolitan areas of Chicago, Dallas, Detroit, Montreal, Nashua, Phoenix, Raleigh, San Diego and Toronto as well as international sales offices located in the metropolitan areas of Bangalore, Beijing, Chengdu, Brussels, Helsinki, Hong Kong, London, Milan, Munich, Nanjing, Osaka, Paris, Seoul, Shanghai, Shenzhen, Stockholm, Taichung, Taipei, Tel Aviv, Tokyo and Xi’an. For information regarding our legal proceedings, see "Note 17. Litigation Settlements and Contingencies" to our consolidated financial statements, included in Item 8. "Financial Statements and Supplementary Data", which is incorporated herein by reference. Our common stock trades on the NASDAQ Global Select Market under the symbol XLNX. As of May 4, 2015, there were approximately 530 stockholders of record. Since many holders’ shares are listed under their brokerage firms’ names, the actual number of stockholders is estimated by us to be approximately 140,000. On March 10, 2015, our Board of Directors declared a cash dividend of $0.31 per common share for the first quarter of fiscal 2016. The dividend is payable on June 3, 2015 to stockholders of record on May 13, 2015. See "Equity Compensation Plan Information," included in Item 12. "Security Ownership of Certain Beneficial Owners and Management and Related Stockholder Matters" in Part III of this Form 10-K for information regarding our equity compensation plans. The following table summarizes the Company's repurchase of its common stock during the fourth quarter of fiscal 2015. (1) In August 2012, the Board of Directors (Board) authorized the repurchase of $750.0 million of the Company’s common stock and debentures (2012 Repurchase Program). In November 2014, the Board authorized the repurchase of an additional $800.0 million of the Company's common stock (2014 Repurchase Program). The shares authorized for purchase under the 2014 Repurchase Program are in addition to the shares authorized for purchase under the 2012 Repurchase Program. The 2012 and 2014 Repurchase Programs have no stated expiration date. Through March 28, 2015, the Company had used the entire amount authorized under the 2012 Repurchase Program, and used $152.6 million of the $800.0 million authorized under the 2014 Repurchase Program leaving a balance of $647.4 million available for future repurchases. The Company’s current policy is to retire all repurchased shares, and consequently, no treasury shares were held as of March 28, 2015 and March 29, 2014. See "Note 14. Stockholders’ Equity" to our consolidated financial statements, included in Item 8. "Financial Statements and Supplementary Data" for information regarding our stock repurchase plans. The following graph shows a comparison of cumulative total return for our common stock, the Standard & Poor’s 500 Stock Index (S&P 500 Index), and the Standard & Poor’s 500 Semiconductors Index (S&P 500 Semiconductors Index). The graph covers the period from April 1, 2010, the last trading day before our fiscal 2010, to March 28, 2015, the last trading day of our fiscal 2015. The graph and table assume that $100 was invested on April 1, 2010 in our common stock, the S&P 500 Index and the S&P 500 Semiconductors Index and that all dividends were reinvested. Note: Stock price performance and indexed returns for our common stock are historical and are not indicators of future price performance or future investment returns. Fiscal 2015 consolidated statement of income data included restructuring charges of $24,491. Fiscal 2014 consolidated statement of income data included litigation charges of $9,410 and loss on extinguishment of convertible debentures of $9,848. Fiscal 2012 consolidated statement of income data included restructuring and litigation charges of $3,369 and $15,400, respectively. Fiscal 2011 consolidated statement of income data included restructuring charges of $10,346 and impairment loss on investments of $5,904. This discussion and analysis of financial condition and results of operations should be read in conjunction with our consolidated financial statements and accompanying notes included in Item 8. "Financial Statements and Supplementary Data." The statements in this Management’s Discussion and Analysis that are forward-looking, within the meaning of the Private Securities Litigation Reform Act of 1995, involve numerous risks and uncertainties and are based on current expectations. The reader should not place undue reliance on these forward-looking statements. Our actual results could differ materially from those anticipated in these forward-looking statements for many reasons, including those risks discussed under "Risk Factors" and elsewhere in this document. Often, forward-looking statements can be identified by the use of forward-looking words, such as "anticipates," "believes," "continue," "could," "estimates," "expects," "intends," "may," "plans," "projects," "should," "will," "would" and other similar terminology, or the negative of such terms. We disclaim any responsibility to update or revise any forward-looking statement provided in this Management’s Discussion and Analysis for any reason. We design, develop and market programmable devices and associated technologies, including advanced ICs in the form of PLDs, software design tools and predefined system functions delivered as IP. In addition to our programmable platforms, we provide design services, customer training, field engineering and technical support. Our PLDs include FPGAs, CPLDs and programmable SoCs. These devices are standard products that our customers program to perform desired logic functions. Our products are designed to provide high integration and quick time-to-market for electronic equipment manufacturers in end markets such as wired and wireless communications, industrial, scientific and medical, aerospace and defense, consumer and automotive, audio, video and broadcast, and data processing. We sell our products globally through independent domestic and foreign distributors and through direct sales to OEMs by a network of independent sales representative firms and by a direct sales management organization. The methods, estimates and judgments we use in applying our most critical accounting policies have a significant impact on the results we report in our consolidated financial statements. The SEC has defined critical accounting policies as those that are most important to the portrayal of our financial condition and results of operations and require us to make our most difficult and subjective judgments, often as a result of the need to make estimates of matters that are inherently uncertain. Based on this definition, our critical accounting policies include: valuation of marketable securities, which impacts losses on debt and equity securities when we record impairments; revenue recognition, which impacts the recording of revenues; and valuation of inventories, which impacts cost of revenues and gross margin. Our critical accounting policies also include: the assessment of impairment of long-lived assets including acquisition-related intangibles, which impacts their valuation; the assessment of the recoverability of goodwill, which impacts goodwill impairment; accounting for income taxes, which impacts the provision or benefit recognized for income taxes, as well as, the valuation of deferred tax assets recorded on our consolidated balance sheet; and valuation and recognition of stock-based compensation, which impacts gross margin, R&D expenses, and selling, general and administrative (SG&A) expenses. Below, we discuss these policies further, as well as the estimates and judgments involved. We also have other key accounting policies that are not as subjective, and therefore, their application would not require us to make estimates or judgments that are as difficult, but which nevertheless could significantly affect our financial reporting. Our short-term and long-term investments include marketable debt securities. As of March 28, 2015, we had marketable debt securities with a fair value of $3.24 billion. We determine the fair values for marketable debt securities using industry standard pricing services, data providers and other third-party sources and by internally performing valuation testing and analyses. See "Note 3. Fair Value Measurements" to our consolidated financial statements, included in Item 8. "Financial Statements and Supplementary Data," for details of the valuation methodologies. In determining if and when a decline in value below the adjusted cost of marketable debt and equity securities is other than temporary, we evaluate on an ongoing basis the market conditions, trends of earnings, financial condition, credit ratings, any underlying collateral and other key measures for our investments. We did not record any other-than-temporary impairment for marketable debt or equity securities in fiscal 2015, 2014 or 2013. Sales to distributors are made under agreements providing distributor price adjustments and rights of return under certain circumstances. Revenue and costs relating to distributor sales are deferred until products are sold by the distributors to the distributors’ end customers. For fiscal 2015, approximately 54% of our net revenues were from products sold to distributors for subsequent resale to OEMs or their subcontract manufacturers. Revenue recognition depends on notification from the distributor that product has been sold to the distributor’s end customer. Also reported by the distributor are product resale price, quantity and end customer shipment information, as well as inventory on hand. Reported distributor inventory on hand is reconciled to deferred revenue balances monthly. We maintain system controls to validate distributor data and to verify that the reported information is accurate. Deferred income on shipments to distributors reflects the estimated effects of distributor price adjustments and the estimated amount of gross margin expected to be realized when distributors sell through product purchased from us. Accounts receivable from distributors are recognized and inventory is relieved when title to inventories transfers, typically upon shipment from Xilinx at which point we have a legally enforceable right to collection under normal payment terms. As of March 28, 2015, we had $87.7 million of deferred revenue and $21.6 million of deferred cost of revenues recognized as a net $66.1 million of deferred income on shipments to distributors. As of March 29, 2014, we had $75.2 million of deferred revenue and $20.1 million of deferred cost of revenues recognized as a net $55.1 million of deferred income on shipments to distributors. The deferred income on shipments to distributors that will ultimately be recognized in our consolidated statement of income will be different than the amount shown on the consolidated balance sheet due to actual price adjustments issued to the distributors when the product is sold to their end customers. Revenue from sales to our direct customers is recognized upon shipment provided that persuasive evidence of a sales arrangement exists, the price is fixed, title has transferred, collection of resulting receivables is reasonably assured, and there are no customer acceptance requirements and no remaining significant obligations. For each of the periods presented, there were no significant formal acceptance provisions with our direct customers. Revenue from software licenses is deferred and recognized as revenue over the term of the licenses of one year. Revenue from support services is recognized when the service is performed. Revenue from Support Products, which includes software and services sales, was less than 5% of net revenues for all of the periods presented. Allowances for end customer sales returns are recorded based on historical experience and for known pending customer returns or allowances. Inventories are stated at the lower of actual cost (determined using the first-in, first-out method) or market (estimated net realizable value). The valuation of inventory requires us to estimate excess or obsolete inventory as well as inventory that is not of salable quality. We review and set standard costs quarterly to approximate current actual manufacturing costs. Our manufacturing overhead standards for product costs are calculated assuming full absorption of actual spending over actual volumes. Given the cyclicality of the market, the obsolescence of technology and product lifecycles, we write down inventory based on forecasted demand and technological obsolescence. These forecasts are developed based on inputs from our customers, including bookings and extended but uncommitted demand forecasts, and internal analyses such as customer historical purchasing trends and actual and anticipated design wins, as well as market and economic conditions, technology changes, new product introductions and changes in strategic direction. These factors require estimates that may include uncertain elements. The estimates of future demand that we use in the valuation of inventory are the basis for our published revenue forecasts, which are also consistent with our short-term manufacturing plans. The differences between our demand forecast and the actual demand in the recent past have not resulted in any material write down in our inventory. If our demand forecast for specific products is greater than actual demand and we fail to reduce manufacturing output accordingly, we could be required to write down additional inventory, which would have a negative impact on our gross margin. Long-lived assets and certain identifiable intangible assets to be held and used are reviewed for impairment if indicators of potential impairment exist. Impairment indicators are reviewed on a quarterly basis. When indicators of impairment exist and assets are held for use, we estimate future undiscounted cash flows attributable to the assets. In the event such cash flows are not expected to be sufficient to recover the recorded value of the assets, the assets are written down to their estimated fair values based on the expected discounted future cash flows attributable to the assets or based on appraisals. Factors affecting impairment of assets held for use include the ability of the specific assets to generate separately identifiable positive cash flows. When assets are removed from operations and held for sale, we estimate impairment losses as the excess of the carrying value of the assets over their fair value. Market conditions are amongst the factors affecting impairment of assets held for sale. Changes in any of these factors could necessitate impairment recognition in future periods for assets held for use or assets held for sale. Long-lived assets such as other intangible assets and property, plant and equipment are considered non-financial assets, and are only measured at fair value when indicators of impairment exist. Goodwill is not amortized but is subject to impairment tests on an annual basis, or more frequently if indicators of potential impairment exist, and goodwill is written down when it is determined to be impaired. We perform an annual impairment review in the fourth quarter of each fiscal year and compare the fair value of the reporting unit in which the goodwill resides to its carrying value. If the carrying value exceeds the fair value, the goodwill of the reporting unit is potentially impaired. For purposes of impairment testing, Xilinx operates as a single reporting unit. We use the quoted market price method to determine the fair value of the reporting unit. Based on the impairment review performed during the fourth quarter of fiscal 2015, there was no impairment of goodwill in fiscal 2015. Unless there are indicators of impairment, our next impairment review for goodwill will be performed and completed in the fourth quarter of fiscal 2016. To date, no impairment indicators have been identified. Xilinx is a multinational corporation operating in multiple tax jurisdictions. We must determine the allocation of income to each of these jurisdictions based on estimates and assumptions and apply the appropriate tax rates for these jurisdictions. We undergo routine audits by taxing authorities regarding the timing and amount of deductions and the allocation of income among various tax jurisdictions. Tax audits often require an extended period of time to resolve and may result in income tax adjustments if changes to the allocation are required between jurisdictions with different tax rates. In determining income for financial statement purposes, we must make certain estimates and judgments. These estimates and judgments occur in the calculation of certain tax liabilities and in the determination of the recoverability of certain deferred tax assets, which arise from temporary differences between the tax and financial statement recognition of revenue and expense. Additionally, we must estimate the amount and likelihood of potential losses arising from audits or deficiency notices issued by taxing authorities. The taxing authorities’ positions and our assessment can change over time resulting in a material effect on the provision for income taxes in periods when these changes occur. We must also assess the likelihood that we will be able to recover our deferred tax assets. If recovery is not likely, we must increase our provision for taxes by recording a reserve in the form of a valuation allowance for the deferred tax assets that we estimate will not ultimately be recoverable. We perform a two-step approach to recognize and measure uncertain tax positions relating to accounting for income taxes. The first step is to evaluate the tax position for recognition by determining if the weight of available evidence indicates that it is more likely than not that the position will be sustained on audit, including resolution of related appeals or litigation processes, if any. The second step is to measure the tax benefit as the largest amount that is more than 50% likely of being ultimately realized. See "Note 15. Income Taxes" to our consolidated financial statements included in Item 8. "Financial Statements and Supplementary Data." Determining the appropriate fair-value model and calculating the fair value of stock-based awards at the date of grant requires judgment. We use the Black-Scholes option-pricing model to estimate the fair value of employee stock options and rights to purchase shares under our ESPP. Option pricing models, including the Black-Scholes model, also require the use of input assumptions, including expected stock price volatility, expected life, expected dividend rate, expected forfeiture rate and expected risk-free rate of return. We use implied volatility based on traded options in the open market as we believe implied volatility is more reflective of market conditions and a better indicator of expected volatility than historical volatility. We will continue to review our input assumptions and make changes as deemed appropriate depending on new information that becomes available. Higher volatility and expected lives result in a proportional increase to stock-based compensation determined at the date of grant. The expected dividend rate and expected risk-free rate of return do not have as significant an effect on the calculation of fair value. higher than the estimated forfeiture rate, then an adjustment is made to increase the estimated forfeiture rate, which will result in a decrease to the expense recognized in the financial statements. If the actual forfeiture rate is lower than the estimated forfeiture rate, then an adjustment is made to decrease the estimated forfeiture rate, which will result in an increase to the expense recognized in the financial statements. The impact of forfeiture true up was not material for all periods presented. The expense we recognize in future periods could also differ significantly from the current period and/or our forecasts due to adjustments in the assumed forfeiture rates. Net revenues in fiscal 2015 were $2.38 billion, which were flat as compared to fiscal 2014. New Product revenues increased 22% in fiscal 2015 but were offset by declines from our Base, Mainstream and Support Products. The increase in New Products was due to higher sales across all end markets, primarily in Communications & Data Center and Industrial, Aerospace & Defense. Net revenues in fiscal 2014 increased 10% compared to fiscal 2013. New Product revenues increased 85% in fiscal 2014 but were offset by declines from our Mainstream, Base and Support Products. The increase in New Products was due to higher sales primarily in Industrial, Aerospace & Defense and Communications. See also "Net Revenues by Product" and "Net Revenues by End Markets" below for more information on our product and end-market categories. No end customer accounted for more than 10% of net revenues for any of the periods presented. New Products include our most recent product offerings and include the Kintex UltraScale, Virtex UltraScale, Virtex-7, Kintex-7, Artix-7, Zynq-7000, Virtex-6 and Spartan-6 product families. Mainstream Products include the Virtex-5, Spartan-3 and CoolRunner-II product families. Base Products consist of our older product families including the Virtex-4, Virtex-II, Virtex-E, Virtex, Spartan-II, Spartan, CoolRunner and XC9500 products. Support Products include configuration solutions, HardWire, software and support/services. These product categories, except for Support Products, are modified on a periodic basis to better reflect the maturity of the products and advances in technology. The most recent modification was made on April 1, 2012, which was the beginning of our fiscal 2013. New Products include our most recent product offerings and are typically designed into our customers’ latest generation of electronic systems. Mainstream Products are generally several years old and designed into customer programs that are currently shipping in full production. Base Products are older than Mainstream Products with demand generated generally by the customers’ oldest systems still in production. Support Products are generally products or services sold in conjunction with our semiconductor devices to aid customers in the design process. Net revenues from New Products increased significantly in fiscal 2015 as a result of sales growth from our 28nm product family. Sales from our 28nm products reached $580.0 million during fiscal 2015. We expect sales of New Products to continue to grow as more customer programs enter into volume production with our 28nm products. In fiscal 2014, strong market acceptance of our 28nm and 40nm product families contributed to the majority of the revenue growth versus the comparable prior year period. Net revenues from Mainstream Products decreased in both fiscal 2015 and fiscal 2014 from the comparable prior year periods. The decreases in both periods were largely due to the decline in sales from our Virtex-5 product family. Net revenues from Base Products decreased in fiscal 2015 and fiscal 2014 from the comparable prior year periods. The decreases in both periods were as expected due to a decline in sales from our Virtex-4 and other older product families. Base Products are mature products and their sales are expected to decline over time. Net revenues from Support Products decreased in fiscal 2015 and 2014 compared to the prior year periods. The decreases in both periods were due to a decline in sales from our PROM products, as well as software products for the fiscal 2015 period. Our end market revenue data is derived from our understanding of our end customers’ primary markets. In the beginning of fiscal 2013, we modified our end market categories in two ways. First, data center customers were moved from the data processing category into the communications category. Additionally, all end market categories were renamed to better reflect actual sales composition. Net revenues by end markets were reclassified into the following four categories: Communications & Data Center; Industrial, Aerospace & Defense; Broadcast, Consumer & Automotive; and Other. The percentage change calculation in the table below represents the year-to-year dollar change in each end market. Net revenues from Communications & Data Center decreased in fiscal 2015 from the comparable prior year period. The decrease in fiscal 2015 was primarily due to lower sales from wireless communications, and to a lesser extent wireline communications. Net revenues from Communications & Data Center increased in fiscal 2014 in terms of absolute dollars from the comparable prior year period due to stronger sales from both wireline and wireless communications, with wireless communications applications driving most of the growth. Net revenues from Industrial, Aerospace & Defense increased in fiscal 2015 from the comparable prior year period. The increase in fiscal 2015 was driven by higher sales across all applications, with industrial, scientific, and medical applications driving most of the growth. Net revenues from Industrial, Aerospace & Defense increased in fiscal 2014 compared to the prior year period due to higher sales across all applications, with defense applications driving most of the growth. Net revenues from Broadcast, Consumer & Automotive decreased in fiscal 2015 from the comparable prior year period. The decrease in fiscal 2015 was due to a decline in sales from consumer applications that was partially offset by increases in automotive as well as audio, video and broadcast applications. Net revenues from Broadcast, Consumer & Automotive increased in fiscal 2014 due to an increase in sales from consumer, audio, video and broadcast, and automotive applications. Net revenues from Other decreased in fiscal 2015 and 2014 from the comparable prior year periods. The decreases in both periods were primarily due to weaker sales from server and storage applications for the fiscal 2014 period. Net revenues in North America increased in fiscal 2015 from the comparable prior year period. The increase was primarily due to stronger sales from certain key programs within Industrial, Aerospace & Defense, which more than offset lower sales from Broadcast, Consumer & Automotive and Other. Net revenues in North America increased in fiscal 2014 from the comparable prior year period. The increase was primarily due to stronger sales from Industrial, Aerospace & Defense, which more than offset lower sales from Communications & Data Center. Net revenues in Asia Pacific decreased in fiscal 2015 from the comparable prior year period. The decrease in fiscal 2015 was primarily driven by lower sales from consumer applications, partially offset by increases in sales from wireless applications and all applications within Industrial, Aerospace & Defense. Net revenues in Asia Pacific increased significantly in fiscal 2014 from the comparable prior year period. The increase was primarily due to an increase in sales across most of our end markets with particular strength from Communications & Data Center, especially wireless communications applications. Net revenues in Europe decreased in fiscal 2015 from the comparable prior year period as sales decreased in all end markets with the exception of Broadcast, Consumer & Automotive; wireless and aerospace and defense applications drove much of the decline. Net revenues in Europe decreased in fiscal 2014 from the comparable prior year period. The decrease was primarily due to weaker sales from Communications & Data Center, which was partly offset by increased sales from aerospace and defense applications. Net revenues in Japan increased in fiscal 2015 from the comparable prior year period. The increase in fiscal 2015 was primarily due to increased sales in Industrial, Aerospace & Defense and Broadcast, Consumer & Automotive. The slight increase in fiscal 2014 net revenues in Japan, as compared to the prior year period, was primarily driven by increased sales in wireline communications applications, which largely offset the decrease from test and measurement applications. Gross margin was 1.4 percentage points and 2.8 percentage points higher in fiscal 2015 and fiscal 2014, respectively, from their comparable prior year period. The improvements in gross margin were driven primarily by our continued focus on margin expansion and cost reduction across our product portfolio, in particular our New Products. Additionally, for fiscal 2015, the improvements in gross margin were also driven by our product and customer mix, whereby the revenue from all applications within Industrial, Aerospace and Defense (which has higher gross margin than our average) increased as a percentage of total revenues due to the timing of key programs, while the revenue from wireless communications (which has lower gross margin than our average) decreased as a percentage of total revenues. Gross margin may be affected in the future due to multiple factors, including but not limited to those set forth above in "Risk Factors," included in Part I of this Form 10-K, shifts in the mix of customers and products, competitive-pricing pressure, manufacturing-yield issues and wafer pricing. We expect to mitigate any adverse impacts from these factors by continuing to improve yields on our New Products, improve manufacturing efficiencies and improve average selling price management. Sales of inventory previously written off were not material during all periods presented. In order to compete effectively, we pass manufacturing cost reductions to our customers in the form of reduced prices to the extent that we can maintain acceptable margins. Price erosion is common in the semiconductor industry, as advances in both product architecture and manufacturing process technology permit continual reductions in unit cost. We have historically been able to offset much of this revenue decline in our mature products with increased revenues from newer products. R&D spending increased $33.3 million, or 7%, during fiscal 2015 from the comparable prior year period. The increase was primarily attributable to higher mask and wafer expenses and employee compensation (including stock based compensation) related to our next generation product development. R&D spending increased $16.9 million, or 4%, during fiscal 2014 from the comparable prior year period. The increase was primarily attributable to higher employee compensation related to variable elements of compensation associated with higher operating margin, and higher stock-based compensation driven by a higher stock price and higher overall headcount. These increases were partially offset by lower mask and wafer expenses. We plan to continue to selectively invest in R&D efforts in areas such as new products and more advanced process development, IP cores and the development of new design and layout software. We may also consider acquisitions to complement our strategy for technology leadership and engineering resources in critical areas. SG&A expenses decreased $24.9 million or 7% during fiscal 2015 from the comparable prior year period as we incurred lower variable spending and legal expenses in fiscal 2015. SG&A expenses increased $12.9 million or 4% during fiscal 2014 from the comparable prior year period as we incurred higher employee-related expenses (including employee compensation related to variable spending associated with higher revenue and operating margin, and stock-based compensation expense). These increases were partially offset by lower legal expenses and other discretionary spending. Amortization expense for the three comparable years was relatively flat as there was no significant change in the acquisition-related intangible assets. During the fourth quarter of fiscal 2015, we announced restructuring measures designed to realign resources and drive overall operating efficiencies. These measures impacted approximately 120 positions, or 3% of our global workforce, in various geographies and functions worldwide. The reorganization plan will be substantially completed by the end of the first quarter of fiscal 2016. We recorded total restructuring charges of $24.5 million in fiscal 2015, primarily related to severance pay expenses and write-offs of acquisition-related intangibles. The charges above have been shown separately as restructuring charges on the consolidated statements of income. The remaining accrual as of March 28, 2015 was primarily related to severance pay and benefits that are expected to be paid during fiscal 2016. During fiscal 2014, we entered into a Settlement and License Agreement with PACT XPP Technologies, AG (PACT). Under the settlement, the parties agreed to dismiss with prejudice all outstanding patent litigation between Xilinx, Avnet, Inc. and PACT and Xilinx agreed to pay PACT a lump sum of $33.5 million. In addition, we received license rights to all patents owned or controlled by PACT. In addition to what we previously accrued prior to the settlement, we recorded an additional $9.4 million in fiscal 2014. 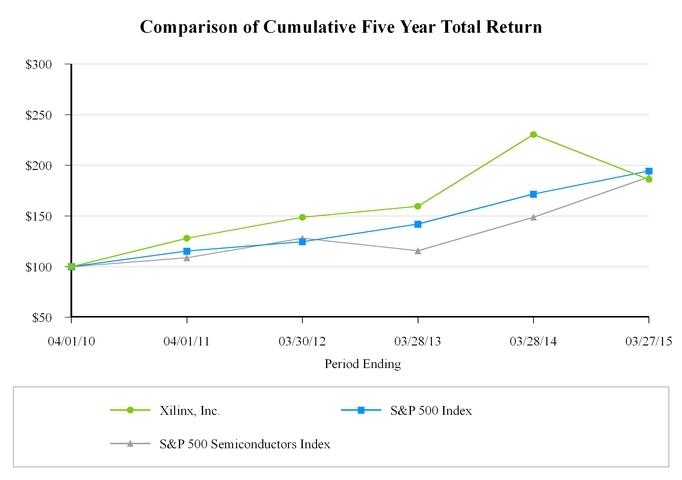 The $5.6 million and $16.4 million increases in stock-based compensation expense for fiscal 2015 and 2014, respectively, as compared to the prior year periods were primarily related to higher expenses associated with restricted stock units, as we granted more restricted stock units at a higher fair value in the prior years. The higher expense from restricted stock units was partially offset by lower expenses related to stock options. On March 12, 2014, we paid $1.23 billion in cash to redeem all of the outstanding $689.6 million (principal amount) of our 3.125% Junior Convertible Debentures due March 15, 2037 (2037 Convertible Notes). In accordance with the authoritative guidance for convertible debentures issued by the Financial Accounting Standards Board (FASB), the redemption payment was allocated between the liability ($377.6 million) and equity ($856.5 million) components of the convertible debentures, using the equivalent rate that reflected the borrowing rate for a similar non-convertible debt prior to the redemption. As a result, we recognized a $9.8 million loss on extinguishment of convertible debentures. Our net interest and other expense decreased by $14.6 million in fiscal 2015 from the comparable prior year period. The decrease was primarily due to a larger gain on the sale of securities in our investment portfolio and land, and to a lesser extent higher interest income from the investment portfolio. The decrease in net interest and other expense in fiscal 2014 from the prior year period was primarily due to higher interest income from the investment portfolio. The difference between the U.S. federal statutory tax rate of 35% and our effective tax rate in all periods is primarily due to income earned in lower tax rate jurisdictions, for which no U.S. income tax has been provided, as we intend to permanently reinvest these earnings outside of the U.S. The increase in effective tax rate in fiscal 2015 compared with fiscal 2014 was primarily due to a shift in geographic mix of earnings with more earnings subject to U.S. tax. the effective tax rate, were offset by a decrease in the rate due to changes in the amount of permanently reinvested foreign earnings, for which no U.S. taxes were provided. We have historically used a combination of cash flows from operations and equity and debt financing to support ongoing business activities, acquire or invest in critical or complementary technologies, purchase facilities and capital equipment, repurchase our common stock and debentures under our repurchase program, pay dividends and finance working capital. Additionally, our investments in debt securities are liquid and available for future business needs. The combination of cash, cash equivalents and short-term and long-term investments as of March 28, 2015 and March 29, 2014 totaled $3.57 billion and $3.65 billion, respectively. As of March 28, 2015, we had cash, cash equivalents and short-term investments of $3.30 billion and working capital of $2.97 billion. As of March 29, 2014, cash, cash equivalents and short-term investments were $2.46 billion and working capital was $2.08 billion. As of March 28, 2015, we had $1.69 billion of cash and cash equivalents and short-term investments held by our non-U.S. jurisdictions. From a financial statement perspective, approximately $832.3 million of the $1.69 billion held by our non-U.S. jurisdictions was available for use in the U.S. without incurring additional U.S. income taxes in excess of the amounts already accrued in our financial statements as of March 28, 2015. The remaining amount of non-U.S. cash and cash equivalents and short-term investments was permanently reinvested and, therefore, no U.S. current or deferred taxes accrued on this amount, which is intended for investment in our operations outside the U.S. We believe our U.S. sources of cash and liquidity are sufficient to meet our business needs in the U.S. and do not expect that we will need to repatriate the funds we have designated as permanently reinvested outside the U.S. Under current tax laws, should our plans change and we were to choose to repatriate some or all of the funds we have designated as permanently reinvested outside the U.S., such amounts would be subject to U.S. income taxes and applicable non-U.S. income and withholding taxes. During fiscal 2015, our operations generated net positive cash flow of $790.8 million, which was $14.1 million lower than the $804.9 million generated during fiscal 2014. The positive cash flow from operations generated during fiscal 2015 was primarily from net income as adjusted for non-cash related items, a decrease in accounts receivable and increases in income taxes payable and deferred income on shipments to distributors. These items were partially offset by a decrease in accounts payable as well as an increase in prepaid expenses and other current assets. Net cash provided by investing activities was $13.0 million during fiscal 2015, as compared to $28.6 million in fiscal 2014. Net cash provided by investing activities during fiscal 2015 consisted of $29.3 million of other investing activities (including sale of land) and $13.3 million of net sales of available-for-sale securities, which was partially offset by $29.6 million for purchases of property, plant and equipment. Net cash used in financing activities was $884.8 million in fiscal 2015, as compared to $483.4 million in fiscal 2014. Net cash used in financing activities during fiscal 2015 consisted of $651.0 million of cash payment to repurchase common stocks and $306.2 million of dividend payments to stockholders, which was partially offset by $52.7 million of net proceeds from issuance of common stock under employee stock plans and $19.7 million for excess tax benefits from stock-based compensation. Accounts receivable decreased by $21.2 million and days sales outstanding (DSO) decreased slightly to 38 days at March 28, 2015 from 41 days at March 29, 2014. The decrease was primarily due to timing of shipments and collections. associated with architecture and manufacturing process advancements. We continually strive to balance these two objectives to provide excellent customer response at a competitive cost. During fiscal 2015, we invested $29.6 million in property, plant and equipment, as compared to $44.9 million in fiscal 2014. Primary investments in fiscal 2015 were for equipment related to the support of our new products development and infrastructures. Current liabilities decreased to $963.2 million at the end of fiscal 2015 from $989.4 million at the end of fiscal 2014. The change was primarily due to a decrease in accounts payable as a result of the timing of purchases and payments, and was partially offset by increases in other current liabilities. Temporary and stockholders’ equity decreased $152.1 million during fiscal 2015 from $2.79 billion in fiscal 2014 to $2.64 billion in fiscal 2015. The decrease was primarily due to repurchase of common stock of approximately $650.0 million, $306.2 million of payment of dividends to stockholders and $10.6 million of other comprehensive loss. These decreases were partially offset by $648.2 million in net income for fiscal 2015, $99.9 million of stock-based compensation, $52.7 million of net issuance of common stock under employee stock plans and $13.9 million for net excess tax benefits from stock-based compensation. The combination of cash, cash equivalents and short-term and long-term investments as of March 29, 2014 and March 30, 2013 totaled $3.65 billion and $3.37 billion, respectively. As of March 29, 2014, we had cash, cash equivalents and short-term investments of $2.46 billion and working capital of $2.08 billion. As of March 30, 2013, cash, cash equivalents and short-term investments were $1.71 billion and working capital was $1.91 billion. During fiscal 2014, our operations generated net positive cash flow of $804.9 million, which was $148.4 million higher than the $656.5 million generated during fiscal 2013. The positive cash flow from operations generated during fiscal 2014 was primarily from net income as adjusted for non-cash related items and increases in accounts payable and accrued liabilities. These items were partially offset by a decrease in income taxes payable as well as increases in accounts receivable, inventories and other assets. Net cash provided by investing activities was $28.6 million during fiscal 2014, as compared to $511.5 million in fiscal 2013. Net cash provided by investing activities during fiscal 2014 consisted of $57.5 million of net sales of available-for-sale securities and $16.0 million of other investing activities, which was partially offset by $44.9 million for purchases of property, plant and equipment. Net cash used in financing activities was $483.4 million in fiscal 2014, as compared to $310.3 million in fiscal 2013. Net cash used in financing activities during fiscal 2014 consisted of $1.23 billion in redemption of the 2037 Convertible Notes, $267.3 million of dividend payments to stockholders and $241.1 million of cash payment for repurchase of common stocks, which was partially offset by $990.1 million of proceeds from issuance of the 2019 and 2021 Notes, $238.2 million of proceeds from issuance of common stock under employee stock plans and $30.8 million for excess tax benefits from stock-based compensation. Accounts receivable increased by $38.7 million and DSO increased slightly to 41 days at March 29, 2014 from 38 days at March 30, 2013. The increase was primarily due to timing of shipments and collections. Inventories increased to $234.0 million as of March 29, 2014 from $201.3 million as of March 30, 2013, with combined inventory days at Xilinx and distribution increasing to 125 days at March 29, 2014 from 108 days at March 30, 2013. During fiscal 2014, our inventory levels were relatively higher than historical trends due to the build ahead of a number of legacy parts in response to the previously planned closure of a particular foundry process line and the build ahead of our 28nm products in anticipation of ramping sales. During fiscal 2014, we invested $44.9 million in property, plant and equipment compared to $30.3 million in fiscal 2013. Primary investments in fiscal 2014 were for equipment and building improvements in order to support our new products development and infrastructures. Current liabilities increased to $989.4 million at the end of fiscal 2014 from $386.8 million at the end of fiscal 2013. The change was primarily due to the reclassification of our convertible debentures as a current liability on our consolidated balance sheet. Temporary and stockholders’ equity decreased $175.6 million during fiscal 2014 from $2.96 billion in fiscal 2013 to $2.79 billion in fiscal 2014. The decrease was primarily due to $646.7 million convertible debt extinguishment, $267.3 million of payment of dividends to stockholders, $242.1 million of repurchase of common stock and $9.2 million of other comprehensive loss. These decreases were partially offset by $630.4 million in net income for fiscal 2014, $94.3 million of stock-based compensation, $238.2 million of issuance of common stock under employee stock plans and $26.4 million for net excess tax benefits from stock-based compensation. Cash generated from operations is used as our primary source of liquidity and capital resources. Our investment portfolio is also available for future cash requirements as is our $250.0 million revolving credit facility entered into in December 2011 (expiring in December 2016). We are not aware of any lack of access to the revolving credit facility; however, we can provide no assurance that access to the credit facility will not be impacted by adverse conditions in the financial markets. Our credit facility is not reliant upon a single bank. There have been no borrowings to date under our existing revolving credit facility. We repurchased 15.3 million shares of our common stock for approximately $650.0 million during fiscal 2015. During fiscal 2014, we repurchased 5.2 million shares of common stock for approximately $242.1 million. During fiscal 2015, we paid $306.2 million in cash dividends to stockholders, representing $1.16 per common share. During fiscal 2014, we paid $267.3 million in cash dividends to stockholders, representing $1.00 per common share. On March 10, 2015, our Board of Directors declared a cash dividend of $0.31 per common share for the first quarter of fiscal 2016. The dividend is payable on June 3, 2015 to stockholders of record on May 13, 2015. Our common stock and debentures repurchase program and dividend policy could be impacted by, among other items, our views on potential future capital requirements relating to R&D, investments and acquisitions, legal risks, principal and interest payments on our debentures and other strategic investments. We anticipate that existing sources of liquidity and cash flows from operations will be sufficient to satisfy our cash needs for the foreseeable future. We will continue to evaluate opportunities for investments to obtain additional wafer capacity, to procure additional capital equipment and facilities, to develop new products, and to potentially acquire technologies or businesses that could complement our business. However, the risk factors discussed in Item 1A and below could affect our cash positions adversely. As of March 28, 2015, marketable securities measured at fair value using Level 3 inputs were comprised of $10.3 million of student loan auction rate securities. The amount of assets and liabilities measured using significant unobservable inputs (Level 3) as a percentage of the total assets and liabilities measured at fair value was less than 1% as of March 28, 2015. See "Note 3. Fair Value Measurements" to our consolidated financial statements, included in Item 8. "Financial Statements and Supplementary Data," for additional information. During fiscal 2015, we redeemed $11.0 million of student loan auction rate securities for cash at par value. The following table summarizes our significant contractual obligations as of March 28, 2015 and the effect such obligations are expected to have on our liquidity and cash flows in future periods. This table excludes amounts already recorded on our consolidated balance sheet as current liabilities as of March 28, 2015. We lease some of our facilities, office buildings and land under non-cancelable operating leases that expire at various dates through November 2035. Rent expense, net of rental income, under all operating leases was approximately $3.2 million for fiscal 2015. See "Note 9. Commitments" to our consolidated financial statements, included in Item 8. "Financial Statements and Supplementary Data," for additional information about operating leases. Due to the nature of our business, we depend entirely upon subcontractors to manufacture our silicon wafers and provide assembly and some test services. The lengthy subcontractor lead times require us to order the materials and services in advance, and we are obligated to pay for the materials and services when completed. We expect to receive and pay for these materials and services in the next three to six months, as the products meet delivery and quality specifications. As of March 28, 2015, we had $35.6 million of non-cancelable license obligations to providers of electronic design automation software and hardware/software maintenance expiring at various dates through June 2017. For purposes of this table we have assumed the principal of our debentures will be paid on maturity dates, which is June 15, 2017 for the 2017 Convertible Notes, March 15, 2019 for the 2019 Notes and March 15, 2021 for the 2021 Notes. See "Note 13. Debt and Credit Facility" to our consolidated financial statements, included in Item 8. "Financial Statements and Supplementary Data," for additional information about our debentures. As of March 28, 2015, $13.2 million of liabilities for uncertain tax positions and related interest and penalties were classified as long-term income taxes payable in the consolidated balance sheet. Due to the inherent uncertainty with respect to the timing of future cash outflows associated with such liabilities, we are unable to reliably estimate the timing of cash settlement with the respective taxing authorities. Therefore, liabilities for uncertain tax positions have been excluded from the contractual obligations table above. As of March 28, 2015, we did not have any significant off-balance-sheet arrangements, as defined in Item 303(a)(4)(ii) of SEC Regulation S-K.
See "Note 2. Summary of Significant Accounting Policies and Concentrations of Risk" to our consolidated financial statements, included in Item 8. "Financial Statements and Supplementary Data," for information about recent accounting pronouncements, including the expected dates of adoption and estimated effects, if any, on our consolidated financial statements. Our exposure to interest rate risk relates primarily to our investment portfolio, which consists of fixed income securities with a fair value of approximately $3.24 billion as of March 28, 2015. Our primary aim with our investment portfolio is to invest available cash while preserving principal and meeting liquidity needs. Our investment portfolio includes municipal bonds, mortgage-backed securities, financial institution securities, non-financial institution securities, student loan auction rate securities, U.S. and foreign government and agency securities, asset-backed securities, bank loans and debt mutual funds. In accordance with our investment policy, we place investments with high credit quality issuers and limit the amount of credit exposure to any one issuer based upon the issuer’s credit rating. These securities are subject to interest rate risk and will decrease in value if market interest rates increase. A hypothetical 100 basis-point (one percentage point) increase or decrease in interest rates compared to rates at March 28, 2015 and March 29, 2014 would have affected the fair value of our investment portfolio by approximately $44.0 million and $53.0 million, respectively. instability in the global financial system, uncertainty related to global economic conditions and concerns regarding sovereign financial stability. Therefore, there is a risk that we may incur other-than-temporary impairment charges for certain types of investments should credit market conditions deteriorate. See "Note 4. Financial Instruments" to our consolidated financial statements, included in Item 8. "Financial Statements and Supplementary Data." Sales to all direct OEMs and distributors are denominated in U.S. dollars. Gains and losses on foreign currency forward contracts that are designated as hedges of anticipated transactions, for which a firm commitment has been attained and the hedged relationship has been effective, are deferred and included in income or expenses in the same period that the underlying transaction is settled. Gains and losses on any instruments not meeting the above criteria are recognized in income or expenses in the consolidated statements of income as they are incurred. As part of our strategy to reduce volatility of operating expenses due to foreign exchange rate fluctuations, we employ a hedging program with forward outlook of up to two years for major foreign-currency-denominated operating expenses. The outstanding forward currency exchange contracts expire at various dates through November 2016. The net unrealized losses, which approximate the fair market value of the forward currency exchange contracts, are expected to be realized into net income within the next two years. Our investments in several of our wholly-owned subsidiaries are recorded in currencies other than the U.S. dollar. As the financial statements of these subsidiaries are translated at each quarter end during consolidation, fluctuations of exchange rates between the foreign currency and the U.S. dollar increase or decrease the value of those investments. These fluctuations are recorded within stockholders’ equity as a component of accumulated other comprehensive income (loss). Other monetary foreign-denominated assets and liabilities are revalued on a monthly basis with gains and losses on revaluation reflected in net income. A hypothetical 10% favorable or unfavorable change in foreign currency exchange rates at March 28, 2015 and March 29, 2014 would have affected the annualized foreign-currency-denominated operating expenses of our foreign subsidiaries by less than $11.0 million for each year. In addition, a hypothetical 10% favorable or unfavorable change in foreign currency exchange rates compared to rates at March 28, 2015 and March 29, 2014 would have affected the value of foreign-currency-denominated cash and investments by less than $5.0 million as of each date.